Core functionality of Daktela V6 application is accessible also via mobile application for Android and iOS (iPhone, iPad). You are able to handle communication with your customers or manage your contact center wherever you are and from environment that is native to your phone. Mobile application shows by default important parts of dashboard just as you know them from Daktela V6. Whatever phone number you may want to dial, you can do this with just one click either directly, from CRM or from ticket contacts. The call will be dialled via Daktela V6 PBX so all features will work including call recording, identification by PBX number and complete statistics and reporting. All contacts and accounts saved in your CRM are available right within the mobile application including fulltext search. 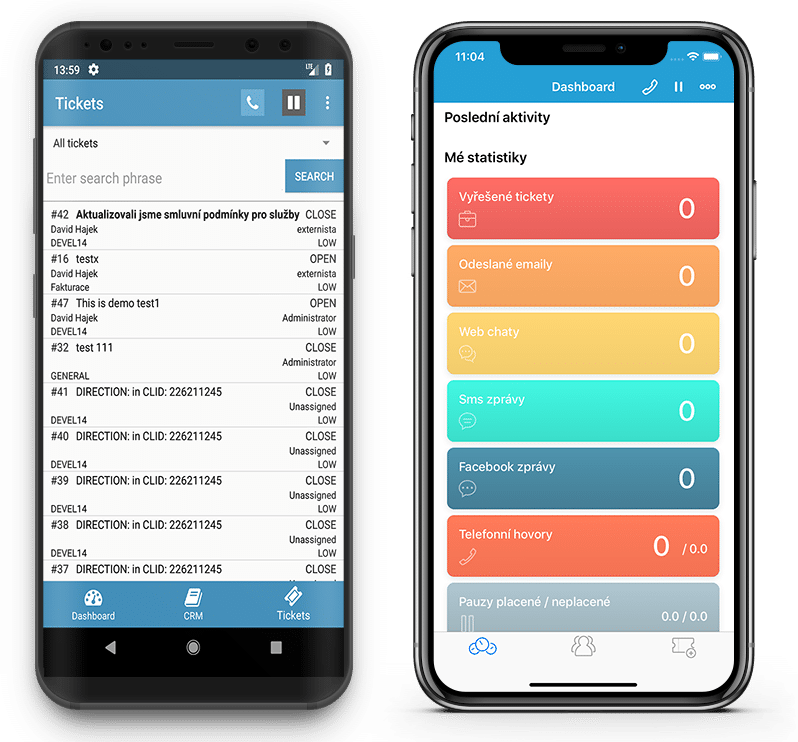 When you receive a phone call on your mobile phone, the caller is automatically identified within Daktela V6 CRM and when found the contact and account will be presented to you. You can manage all tickets saved within Daktela V6 including change of major properties, commenting tickets, assigning to other users etc. Do you need to set yourself as ready or set a pause? Mobile application checks your state in realtime and enables you perform changes to it. You can use the mobile application within your Daktela V6 installation right away and for free as part of standard license fees of individual purchased modules. In order to activate the application let us know at daktela@daktela.com. You can download the application from app stores of individual platforms or by clicking the app store icon at the top of this page.